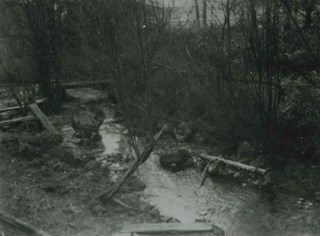 "Burnaby - Deer Lake Brook"
Photograph of Deer Lake Creek; historically known as Deer Lake Brook. The banks and trees are covered with snow. 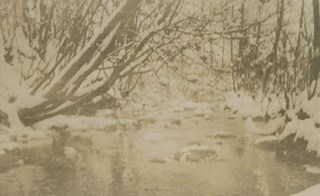 Photograph of Deer Lake Creek, historically known as Deer Lake Brook. 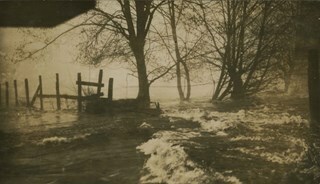 Photograph of Deer Lake Creek; historically known as Deer Lake Brook, during a flood. 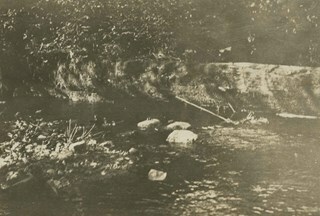 Photographic panorama of Deer Lake Creek; historically known as Deer Lake Brook, in flood. 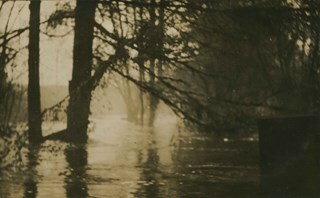 Photograph of Deer Lake Creek; historically known as Deer Lake Creek, in flood. 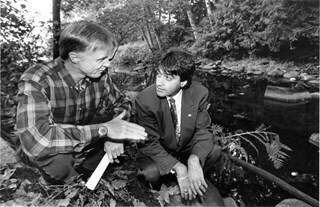 Photograph of Mark Angelo, chair of the BC Outdoor Recreation Council, with provincial Minister of Environment Moe Sihota near Deer Lake Creek. Note in black ink on recto of photograph reads: "10/01 Bby p.1 102% / 2700 B. Bby / Mario"
Photograph of three people outside Claude Hill's boathouse - all unidentified. 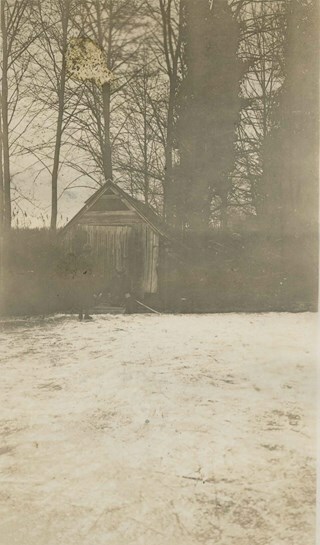 The boathouse was located at the mouth of Deer Lake Creek (historically known as Deer Lake Brook) This photograph was taken during the winter of 1924 and the water is frozen over with ice. Photograph of the "Gibraltar" rock at mouth of Deer Lake Creek. 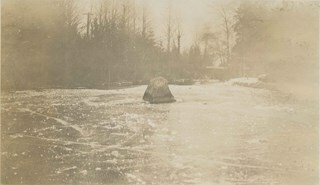 This photograph was taken during the winter of 1924 and the lake is frozen over with ice. The surface of the lake is covered with marks made by ice skates. Deer Lake Creek is historically known as Deer Lake Brook. 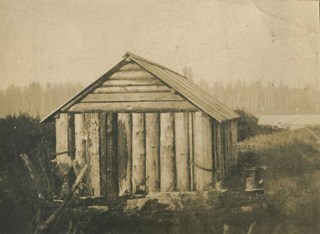 Photograph of Bernard Hill's boathouse on Burnaby Lake. Built in 1902, the boathouse was located on Deer Lake Brook at the southwestern tip of Burnaby Lake. Photograph of E.B. 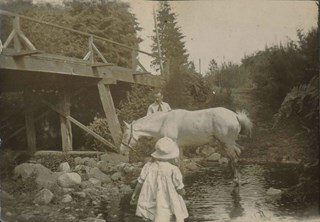 Wetenhall leading a horse to water. Kitty Hill is the foreground and a wooden trestle bridge spans Deer Lake Brook in the background. 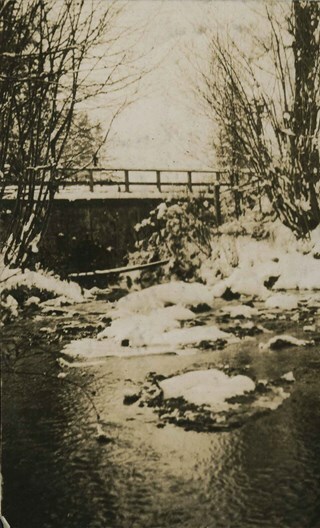 Photograph of a bridge over Deer Lake Brook, covered with snow. 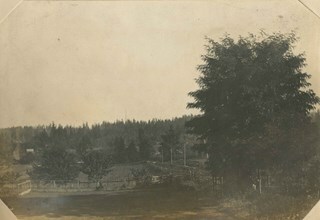 This photograph was probably taken on the property belonging to Claude Hill, known as "Brookfield." 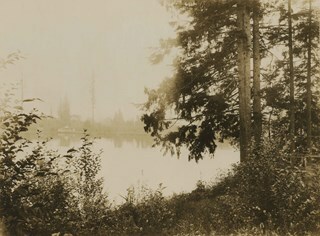 Photograph of Deer Lake. An earlier catalogue record from 1988 notes that the view is of the north shore of Deer Lake, looking northeast. Also noted is that the Hart's boathouse is in view at the mouth of Deer Lake Brook, and that the Anderson and Mather houses on can be seen on Deer Lake Avenue.